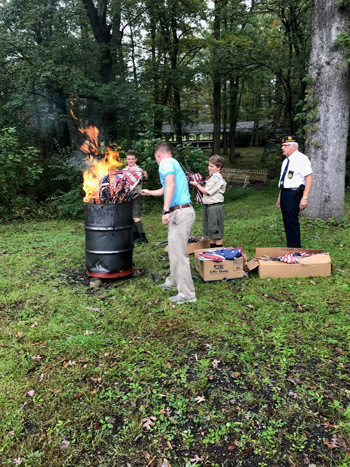 On Saturday, I spoke at and participated in a flag retirement ceremony at the Walnutport American Legion Post 899. As a member of the Pennsylvania National Guard who has fought under the flag, I appreciate when proper flag etiquette is followed. Thank you to all who attended and donated tattered and worn flags. 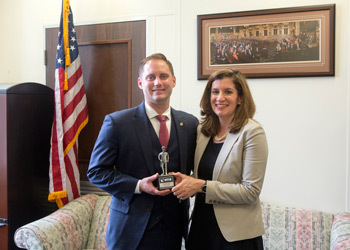 This week, I was honored to be presented with a Guardian of Small Business Award by the Pennsylvania Chapter of the National Federation of Independent Business (NFIB) in recognition of my 100 percent small business voting record during the 2017-18 legislative session. Pictured with me is NFIB Grassroots Manager Margaret Parsons. The role of government is to help create an environment for prosperity and economic growth. Unfortunately, excessive regulation, over-taxation and an uncertain economic climate have made starting and maintaining a small business in this Commonwealth extremely difficult. I will continue to do all I can to help our small businesses grow, prosper and create family-sustaining jobs. For more information on this year’s Guardian of Small Business Awards, click here. Liquor Code Enforcement Officer Derrick DeVaney of the bureau’s Allentown District Office will lead the presentation. Time will be allotted for a question-and-answer session.